AK Health Quotient India Pvt. Ltd is a health management company founded by a seasoned Pathologist, people from corporate India and abroad. Management team has around 50 years of total experience in Diagnostic space in India and therefore understand the need and importance of Diagnostics in treatment of a Patient, well being of corporate citizen. We are into Diagnostic, Preventive Healthcare and Wellness. 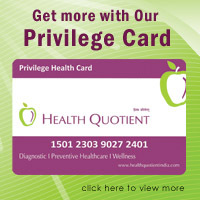 Health Quotient, our Diagnostic arm, is a chain of diagnostic centers. Our Reference Laboratory (located in South Delhi) along with other Satellite laboratories (refer to our Network) provides us a sophisticated state of the art Pathology laboratories network where all kinds of General and specialized tests are done on world class Auto-Analyzers in highly automated environment in the supervision of Pathologist, Microbiologist and Biochemist along with experience Technicians and Quality Managers. Our Diagnostic centers different tests in Pathology, Radiology and Cardiology “Diagnostic Under one Roof” concept. For Corporates (Government & Private sector ), Insurance companies, Heath service provides and TPAs , we offer end to end customized services at our centers and also at companies office/factory/warehouse and/or client home using our Mobile Diagnostic Units. We have been already proud to be working with different esteemed organizations on PAN India basis. Result quality and Customer service are two of our main pillars to win and sustain your trust and relationship. We have wide range of Diagnostic portfolio to cater the E2E (end to end) diagnostic needs of Patient, Doctors , Hospitals and corporate. We consider diagnostics, a great responsibility on us, which can not be left on chance. We have deployed SOP (Standard Operating Procedures) based on Best Diagnostic Practices and International and Indian standards like ISO and NABL . We have well planned service department equipped to meet and exceed your service expectations.